George W. Bush wants to help people 'Get Motivated!'. 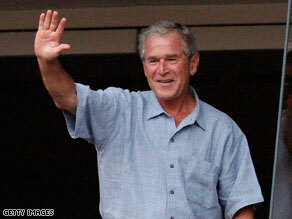 WASHINGTON (CNN) - Former President George W. Bush has a new speaking gig. Bush will be featured as the "special guest speaker" at an October 26 "Get Motivated!" business seminar in Fort Worth, Texas, according to an announcement on the organization's Web site. Tamara Lowe, the Co-Founder and Executive Vice President of Get Motivated Seminars, Inc., said in a phone interview that the former president will appear live and in person at the upcoming event. Lowe estimated that Bush will speak for roughly 20 minutes. Lowe also said that the company has all the necessary safety precautions in place to host a former president. Bush's former Secretary of State Colin Powell and former New York City Mayor Rudy Giuliani are set to join Bush at the October 26 event. The former president is also scheduled to participate in another "Get Motivated!" seminar in San Antonio, Texas on December 2, according to the company's Web site. "For a limited time only," the Web site says, tickets are available to the October and December events for $4.95 per person or $19 for a group. CNN is awaiting confirmation from a representative of the former president about the scheduled appearances at the seminars. WASHINGTON(CNN)– In the latest installment of CNN=Politics Daily: First Lady Michelle Obama met with students out on the South Lawn Wednesday to call for nutritious change in America. CNN's Kate Bolduan shines the spotlight on what schools across the country are doing to improve their lunch choices. Meanwhile: Secretary of State Hillary Clinton warns Tehran again that the administration's openness to diplomatic engagement with Iran isn't open-ended, as concern continues to rise over the state of Iran's nuclear program. CNN Foreign Affairs Correspondent Jill Dougherty reports on Clinton's latest comments on nuclear threats facing the United States. Plus: President Obama announced a plan today to help banks free up credit for struggling small businesses. Could there be a stimulus, round two ahead? CNN Senior Congressional Correspondent Dana Bash reports. Finally: Sen. John Kerry, back from Afghanistan, briefed President Obama at the White House today. CNN White House Correspondent Dan Lothian takes a look at new hints that President Obama may be moving closer to a decision on troop levels in Afghanistan. 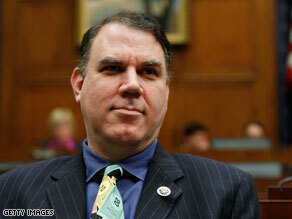 Rep. Alan Grayson launches Web site honoring the dead. WASHINGTON (CNN) - Rep. Alan Grayson - whose statement that Republican health care calls for the sick to "die quickly" - has launched a new Web site, namesofthedead.com, that invites users to submit stories of loved ones who have died because they lack health insurance. "I have created this project in their memory," reads a message on the new site. "I hope that honoring them will help us end this senseless loss of American lives." In the midst of the national health care debate, the freshman Florida Democrat rose to national prominence recently when he declared from the House floor that the Republican health care reform proposal is "Don't get sick, and if you do get sick, die quickly." The National Republican Congressional Committee slammed Grayson Wednesday over the new site. "What is wrong with this man?" NRCC spokesman Andy Sere said in a statement e-mailed to CNN. "Alan Grayson's morbid exploitation of 'the dead' for personal political gain may be the most shameless stunt he's pulled yet." Sere also told CNN that the NRCC believes the new Grayson site violates House ethics rule. According to the House Ethics Manual, Members' official House Web sites may not include any personal or political information and also may not be directly linked to or refer to Web sites created or operated by a campaign or any campaign-related entity. House rules also prohibit Members' campaign Web sites from including a link to Members' official House Web sites and prohibit official House Web sites from being advertised on campaign Web sites or other campaign-related material. Grayson's new site contains links to both Grayon's official House site and his re-election campaign's site. WASHINGTON (CNN) - Michelle Obama may be a renowned fitness fiend - but she's equally devoted to her fries. The first lady - who has spoken of her affection for the deep-fried staple - told a crowd of students Wednesday that her love affair with fast food had continued in the White House, where she's confessed sneaking out for an occasional run to the Five Guys burger joint. "My favorite food in the whole wide world are french fries," Obama told a crowd of local students on the South Lawn of the White House during an event to promote healthy eating. "I love them. Dearly. Deeply. I have a good relationship with french fries and I would eat them every single day if I could. I really would." NEW YORK (CNNMoney.com) - The Obama administration will soon order the nation's biggest bailed-out companies to drastically cut pay packages for their top executives, a senior administration official confirmed to CNN Wednesday. Kenneth Feinberg, who was named the White House's pay czar in June, will demand that the seven largest bailout recipients lower the total compensation for their top 25 highest paid employees by 50%, on average, the official told CNN. WASHINGTON (CNN) - The man who oversaw the flawed prosecution of corruption charges against former U.S. Sen. Ted Stevens of Alaska will leave his post at the Justice Department at the end of this week, a top official there announced Wednesday. William Welch - who heads the Office of Public Integrity, which is responsible for investigating and prosecuting bribery and other public corruption cases - will leave Washington and become a federal prosecutor in Massachusetts, said Assistant Attorney General Lanny Breuer. A federal judge harshly criticized the trial prosecutors for, among other things, failing to share certain evidence with the defense as required. TARP Special Inspector General Neil Barofsky said the government's decision to support bank mergers may have put the U.S. economy more at risk. WASHINGTON (CNN) - The banking system today may be in a more precarious position than it was a year ago, the man charged with overseeing a $700 billion bailout program said Wednesday. Neil Barofsky, the special inspector general managing the Troubled Asset Relief Program, told CNN's Wolf Blitzer on Wednesday that the government's decision to support bank mergers over the past year may have put the U.S. economy more at risk. 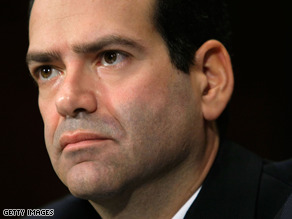 "These banks that were too big to fail are now bigger," Barofsky said. "Government has sponsored and supported several mergers that made them larger and that guarantee, that implicit guarantee of moral hazard, the idea that the government is not going to let these banks fail, which was implicit a year ago, is now explicit, we've said it. So if anything, not only have there not been any meaningful regulatory reform to make it less likely, in a lot of ways, the government has made such problems more likely. "Potentially we could be in more danger now than we were a year ago," he added. Earlier in the day, Barofsky issued a scathing report criticizing the Treasury Department for not being transparent enough about how bailout money was being spent. He warned that this could have lasting effects. "I think this cynicism, this anger, this distrust of government that's born in part from a lack of transparency could have far-reaching ramifications, whether there's a next crisis or when anytime the government is going to call on the American people, the taxpayer, to support necessary programs," Barofsky said. NEW YORK (CNNMoney.com) - The Obama administration will soon order the nation's biggest bailed-out companies to drastically cut pay packages for their top executives, according to several reports published Wednesday. Kenneth Feinberg, who was the White House's so-called "pay czar" in June, is expected to demand that the seven largest bailout recipients lower the total compensation for their top 25 highest paid employees by 50%, on average, according to reports in both the New York Times and Wall Street Journal. Gov. 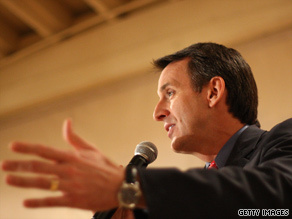 Pawlenty has penned a letter to his fellow governors. WASHINGTON (CNN) – Minnesota Republican Gov. Tim Pawlenty reached out Wednesday to his fellow governors throughout the country with his proposal for states to work together to allow the purchase of health insurance across state lines. Pawlenty's proposal, called the "Interstate Health Insurance Compact," "would allow participating states to share common regulatory standards," Pawlenty writes in a letter to his 49 counterparts. Pawlenty also wrote that banding together would allow states to facilitate purchasing insurance across their borders and, drawing on terms frequently used by the Obama administration in its push for health care reform legislation, the Minnesota Republican said such a change would increase "competition and choice." "[H]ealth insurance is an area that would benefit from a consistent standards to enable true market competition to flourish nationally," Pawlenty's letter says, "Those standards should be informed by the collective wisdom of those closest to consumers – states and their insurance regulators."